Fully Automatic Smart AGM/GEL/SLA Battery Charger and Maintainer. Easy to use "hook it up and forget it" operation, this smart charger will detect what type of battery is connected and charge it properly. The BC1204 also features many safety features. If the battery polarity is reversed or output is shorted, all LEDs will flash simultaneously, DISCONNECT & CHECK. The VMAX BC1204 utilizes the latest technology in AGM, Gel and flooded lead-acid battery charging, ideal for use with 10-50AH batteries (with 3-15hr est. charging time), yet capable of charging up to 80AH batteries in 24 hours. 1. Connect the AC cord to AC outlet. The “power” LED will light on solid. 2. Connect positive charger clip (red) to positive battery terminal, the black clip to negative. The “25%~100%” LEDs will light in a sequence. If the batteries polarity is reversed or output is shorted, all LEDs will flash simultaneously, DISCONNECT & CHECK. 3. Depending on the charged capacity, 25%~100% LEDs will light up solid. When all are ON, the battery is fully charged. You can disconnect the battery to use OR keep it connected to charge in float mode. If battery stays at Stage 2 after 24 hours of charging, then the battery is defective. "I've used a number of 12v chargers, but this is the best. I primarily use it to recharge a VMAX 35Ah AGM trolling motor and 8Ah AGM fish finder battery. I sometimes spend 10 hours or more on the water on a pontoon, so I needed the lightest batteries I could get away with, and maximizing their charge is essential. So far, this system has always got me back to the dock with power to spare. Four green and one red LED lights give info re discharge level at start of charge and real-time charge status (lights also flash if you reverse polarity). When done, it shifts to trickle charge, so battery is always at its peak. Also like that it is small and light compared to other chargers. Standard computer power cord (IEC) connector can be removed, and it easily stores tackle bag. I own three of them. I also own a BC 1215. I use one BC 1204 to maintain a bank of two Vmax SLR155 solar batteries. I use one BC 1204 to maintain a UPG 12V 100Ah battery and I use one BC 1204 to maintain a Deka Intimidator AGM deep cycle car battery. I use the BC 1215 to charge the bank and the UPG when I deeply discharge them. When they are fully recharged, I put back the BC 1204 on them for maintenance. I'm a happy man. "A great float charger and intelligent charger for my deep cycle marine battery. Lightweight and simple to use and a good price...."
"I like this charger/maintainer. Simple to use and works well. 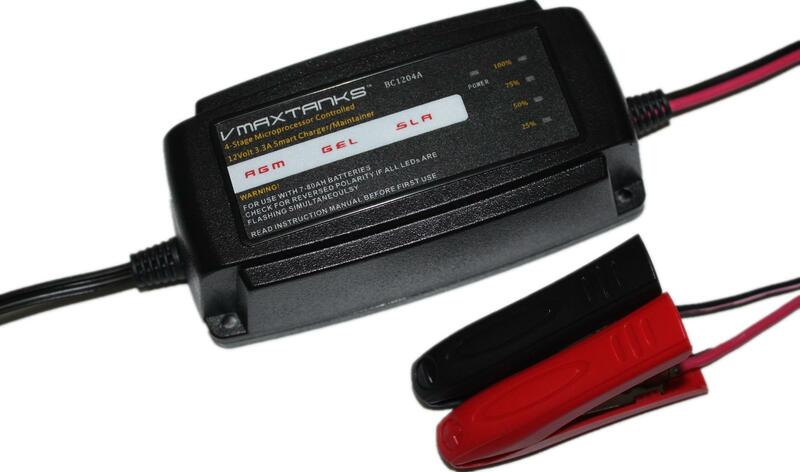 I use it mainly for my 35AH VMAX battery for my trolling motor but have charged other batteries with it. It gets a little warm towards the end of a charging cycle, but cools right down when battery is fully charged and unit is in maintain mode."